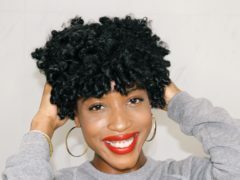 As those of you who frequent AishaBeau.com know, I have been a Glossier Brand Rep for quite some time now — however, it hasn’t been until recently that they’ve asked me to be one of the few to help launch a new product. So needless to say, I was SO excited when they e-mailed about Lidstar ($18). This past Sunday, Glossier planned to debut Lidstar, their first ever eye shadow, on a number of celebs walking the Oscar’s red carpet. And to coincide they asked a few reps to have a debut of their own and host “Gloscars” viewing parties with friends. So my girlfriends and CJ came through to have one of the most Instagrammable viewing parties I’ve ever had. I’ve of course worn and featured eye shadow before, but to be honest it’s not one of my favorite makeup categories. For me, eye shadow was something generally reserved for a night out because it can really take away from the effortlessness of a beauty look. 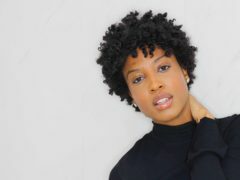 However, given Glossier’s track record for making products that enhance instead of hide one’s features–which is pretty much the ethos of AishaBeau.com, I had to give them a try. And of course, I wasn’t disappointed. Lidstar comes in 6 soft glistening shades made of ultra-fine reflective pearls to give a subtle yet uniquely iridescent glow. Natalie and I swatched all of them to see the difference in pigmentation on opposite skin tones. 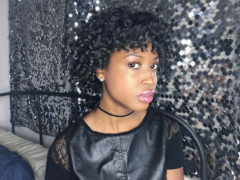 The color I gravitated towards most for myself was “Fawn”, but overall I was pleased with just how perfectly they blended with my complexion. I could actually see myself wearing these during the day, and not look like I’m doing way too much. 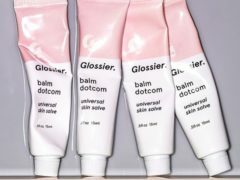 When it comes to actually using them, you know Glossier loves a good finger tap application, and Lidstar is no different. The eye shadows come in a tube similar to lip gloss with an applicator to assist in distributing the product. Once the shadow is swiped on to distribute I simply tapped using my ring finger to blend and even it out. I love the liquid base of this eye shadow because often times with other eye shadow it can be pretty messy and fly all over my face. With Lidstar it goes on as a moisturizing liquid and then dries matte for all day wear. With most eye shadow you need a primer to maintain the moisture as you wear it, but for me it didn’t dry out (my skin type is oily). However, the only critique I have is that my girlfriend Nikki, who has combination skin, said it made her lids feel dry after a while. Overall, I’m sold on Lidstar. I love that each shade actually caters to blending with varying skin tones while still maintaining a natural glow. I’m thinking this may need to be my new summertime staple. Here’s a look at my lovely girl friends rocking a few different shades!